We are a broad coalition of residents, civic leaders and organizations joining together to defeat two destructive initiatives that will be on the ballot this fall. 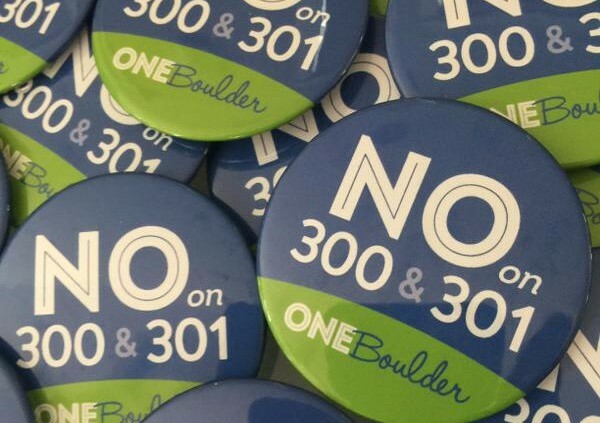 Why are we asking you to VOTE NO on 300 & 301? We believe Boulder wins when we work together as one community to manage our growth responsibly and meet our environmental, housing and transportation goals. But ballot initiatives 300 & 301 undermine that vision. NO on Ballot Initiative 300! The “Neighborhoods Right to Vote” proposes to divide the community into undefined neighborhood voting districts. It would allow a tiny minority of people to force an election on virtually any zoning change – undermining community-wide planning, costing taxpayers unnecessary election costs and resulting in less revenue for police, fire and other essential services. Pits neighbor against neighbor, and Boulder neighborhoods against each other. Divides Boulder into voting districts that include 66 specified neighborhoods. Just 10% of the voters in a neighborhood may call an expensive election that your tax dollars will fund. NO on Ballot Initiative 301! Just like the “Taxpayers Bill of Rights” TABOR amendment that has crippled the state budgeting process the “New Development Shall Pay Its Own Way” amendment is a cleverly worded recipe for unintended consequences. It writes an undefined fee on new development into the City Charter that would effectively shut down Boulder until the courts resolve the disputed language. Even proponents have admitted it would lead to lawsuits and the City Attorney has recommended halting all building permits if 301 passes. Negatively impacts jobs, small businesses and the economy. Current significant fees from development already fund vital projects and services. 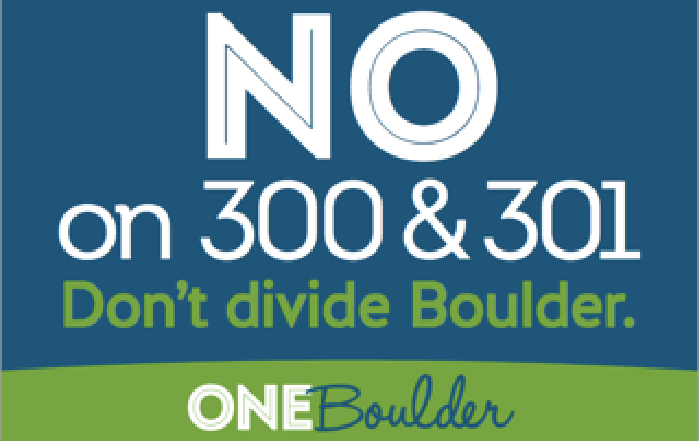 Please join the One Boulder campaign – here are FIVE things you can do! VOTE NO on 300 & 301! VERIFY your voter registration or REGISTER to vote. 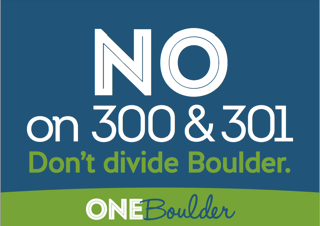 JOIN our Coalition – Go to oneboulder.org/join-us and add your name, business or organization as a supporter. SHARE on Social Media – Follow One Boulder on Facebook and Twitter and share our messages with #OneBoulder2015. If you have one, show us your button! DISPLAY Your Support – contact us to get this fall’s must-have magnetic campaign button, yard or window signs, and flyers. DONATE to the Campaign – at oneboulder.org/donate – No donation is too big, or too small! Your dollars buy ads, mail, signs, buttons and more to get the word out. Page Two Cafe, 6565 Gunpark Drive. Open 7:00 a.m. to 4:00 p.m., 7 days a week. The Boulder Chamber, 2440 Pearl Street. Open 8:30 a.m. to 4:30 p.m. Mon.- Fri.
Sopher Sparn Architects, 1731 15th St., Ste. 250. Open 8:00 a.m. to 5:00 p.m., Mon. – Fri. Private Residences, front porches of 1726 Mapleton Ave. | 4310 Ludlow St. | 802 Linden Ave. from 8:00 a.m. to 8:00 p.m. Please continue to encourage your friends, neighbors and colleagues to go to our website to let us know how they would like to support the campaign AGAINST Ballot Initiatives 300 & 301. It’s as simple as clicking the button below!